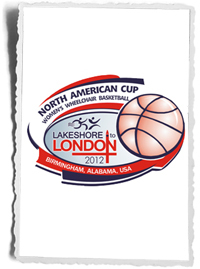 After a slow start to the opening day of the North American Cup, the Sr. Women’s wheelchair basketball team showed their mettle down the stretch of Day #1 in Birmingham, Alabama. The first of three games throughout the day, Canada took on Germany to kick off the tournament, and despite a hard-fought effort from the Canucks, the Germans cruised to a 64-42 victory. Janet McLachlan had 14 points and 13 rebounds in the loss, while Kendra Ohama added 8 points and Tracey Ferguson chipped in with 6. Canada’s second game saw them pitted against their regional rivals, the United States. While the red, white, and blue may have had the home-court advantage, they failed to capitalize on it, as Canada edged out a 65-62 win. McLachlan led the way for Canada with a triple-double (19 points, 14 rebounds, 10 assists), while Katie Harnock notched 15 points of her own, including two crucial free throws to seal the victory late in the game. After an hour-long break, Canada was right back on the court to square off against Great Britain. Carrying the momentum from the previous win, the Sr. Women played to a 55-49 victory over the British. Once again, McLachlan was the offensive force for Canada, scoring 23 points and 13 rebounds in the win, while Tara Feser added 10. Assistant Coach Marni Abbott-Peter says she was proud of the team’s effort surrounding the gruelling schedule. Abbott-Peter also passed along a memorable moment for one Team Canada rookie. Canada (2-1) will close out round-robin play against the Netherlands Friday morning, and depending upon ranking, will either play later that afternoon, or Saturday morning.